This article is about the Life Science, chemical and pharmaceutical company. For other uses, see Bayer (disambiguation). "Bayer Aspirin" redirects here. For the pharmaceutical product, see aspirin. Bayer AG (/ˈbeɪ.ər, ˈbaɪ.ər/; German: [ˈbaɪɐ]) is a German multinational pharmaceutical and life sciences company and one of the largest pharmaceutical companies in the world. 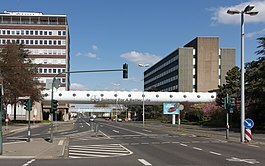 Headquartered in Leverkusen, where its illuminated corporate logo, the Bayer cross, is a landmark, Bayer's areas of business include human and veterinary pharmaceuticals; consumer healthcare products; agricultural chemicals and biotechnology products; and high-value polymers. The company is a component of the Euro Stoxx 50 stock market index. Werner Baumann has been CEO since 2016. Founded in Barmen in 1863 as a dyestuffs factory, Bayer's first and best-known product was aspirin. In 1898 Bayer trademarked the name heroin for the drug diacetylmorphine and marketed it as a cough suppressant and non-addictive substitute for morphine until 1910. Bayer also introduced phenobarbital; prontosil, the first widely used antibiotic and the subject of the 1939 Nobel Prize in Medicine; the antibiotic Cipro (ciprofloxacin); and Yaz (drospirenone) birth control pills. In 1925 Bayer was one of six chemical companies that merged to form IG Farben, the world's largest chemical and pharmaceutical company. The Allied Control Council seized IG Farben after World War II,[a] because of its role in the Nazi war effort and involvement in the Holocaust, which included using slave labour from concentration camps. It was split into its six constituent companies in 1951, then split again into three: BASF, Bayer and Hoechst. Bayer played a key role in the Wirtschaftswunder in post-war West Germany, quickly regaining its position as one of the world's largest chemical and pharmaceutical corporations. In 2006 the company acquired Schering, in 2014 it acquired Merck & Co.'s consumer business, with brands such as Claritin, Coppertone and Dr. Scholl's, and in 2018 it acquired Monsanto, a leading producer of genetically engineered crops, for $63 billion. Bayer CropScience develops genetically modified crops and pesticides. Bayer AG was founded as a dyestuffs factory in 1863 in Barmen (later part of Wuppertal), Germany, by Friedrich Bayer and his partner, Johann Friedrich Weskott, a master dyer. Bayer was responsible for the commercial tasks. Fuchsine and aniline became the company's most important products. The headquarters and most production facilities moved from Barmen to a larger area in Elberfeld in 1866. Friedrich Bayer (1851–1920), son of the company's founder, was a chemist and joined the company in 1873. After the death of his father in 1880, the company became a joint-stock company, Farbenfabriken vorm. Friedr. Bayern & Co, also known as Elberfelder Farbenfabriken. A further expansion in Elberfeld was impossible, so the company moved to the village Wiesdorf at Rhein and settled in the area of the alizarin producer Leverkus and Sons. A new city, Leverkusen, was founded there in 1930 and became home to Bayer AG's headquarters. 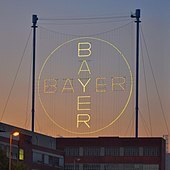 The company's corporate logo, the Bayer cross, was introduced in 1904, consisting of the word BAYER written vertically and horizontally, sharing the Y and enclosed in a circle. An illuminated version of the logo is a landmark in Leverkusen. Bayer's first major product was acetylsalicylic acid—first described by French chemist Charles Frederic Gerhardt in 1853—a modification of salicylic acid or salicin, a folk remedy found in the bark of the willow plant. 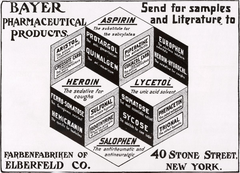 By 1899 Bayer's trademark Aspirin was registered worldwide for Bayer's brand of acetylsalicylic acid, but it lost its trademark status in the United States, France and the United Kingdom after the confiscation of Bayer's US assets and trademarks during World War I by the United States, and because of the subsequent widespread usage of the word. The term aspirin continued to be used in the US, UK and France for all brands of the drug, but it is still a registered trademark of Bayer in over 80 countries, including Canada, Mexico, Germany and Switzerland. As of 2011 approximately 40,000 tons of aspirin were produced each year and 10–20 billion tablets consumed in the United States alone for prevention of cardiovascular events. It is on the WHO Model List of Essential Medicines, the most important medications needed in a basic health system. There is an unresolved controversy over the roles played by Bayer scientists in the development of aspirin. Arthur Eichengrün, a Bayer chemist, said he was the first to discover an aspirin formulation that did not have the unpleasant side effects of nausea and gastric pain. He also said he had invented the name aspirin and was the first person to use the new formulation to test its safety and efficacy. 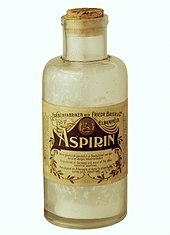 Bayer contends that aspirin was discovered by Felix Hoffmann to help his father, who had arthritis. Various sources support the conflicting claims. Most mainstream historians attribute the invention of aspirin to Hoffmann and/or Eichengrün. Heroin (diacetylmorphine), now illegal as an addictive drug, was introduced as a non-addictive substitute for morphine, and trademarked and marketed by Bayer from 1898 to 1910 as a cough suppressant and over-the-counter treatment for other common ailments, including pneumonia and tuberculosis. Bayer scientists were not the first to make heroin, but the company led the way in commercializing it. 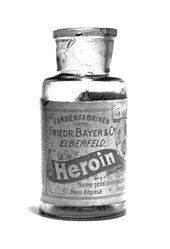 Heroin was a Bayer trademark until after World War I. In 1903 Bayer licensed the patent for the hypnotic drug diethylbarbituric acid from its inventors Emil Fischer and Joseph von Mering. It was marketed under the trade name Veronal as a sleep aid beginning in 1904. Systematic investigations of the effect of structural changes on potency and duration of action at Bayer led to the discovery of phenobarbital in 1911 and the discovery of its potent anti-epileptic activity in 1912. Phenobarbital was among the most widely used drugs for the treatment of epilepsy through the 1970s, and as of 2014 it remains on the World Health Organization's list of essential medications. During World War I (1914–1918), Bayer's assets, including the rights to its name and trademarks, were confiscated in the United States, Canada and several other countries. In the United States and Canada, Bayer's assets and trademarks, including the well-known Bayer cross, were acquired by Sterling Drug, a predecessor of Sterling Winthrop and were not reclaimed until 1994. In 1916 Bayer scientists discovered suramin, an anti-parasite drug that is still sold by Bayer under the brand name Germanin. The formula of suramin was kept secret by Bayer for commercial reasons, but it was elucidated and published in 1924 by Ernest Fourneau and his team at the Pasteur Institute. It is on the World Health Organization's List of Essential Medicines. In 1925 Bayer became part of IG Farben, a German conglomerate formed from the merger of six chemical companies: BASF, Bayer, Hoechst (including Cassella and Chemische Fabrik Kalle), Agfa, Chemische Fabrik Griesheim-Elektron, and Chemische Fabrik vorm. Weiler Ter Meer. In the 1930s Gerhard Domagk, director of Bayer's Institute of Pathology and Bacteriology, working with chemists Fritz Mietzsch and Joseph Klarer, discovered prontosil, the first commercially available antibacterial drug. The discovery and development of this first sulfonamide drug opened a new era in medicine. [page needed] Domagk won the Nobel Prize in Physiology or Medicine in 1939 "for the discovery of the antibacterial effects of prontosil". He was forced by the Nazi Party to relinquish the reward; German citizens had been forbidden from accepting Nobel prizes since the Nobel committee had awarded the 1935 Nobel Peace Prize to a German pacifist, Carl von Ossietzky. Helge Wehmeier, then CEO of Bayer, offered a public apology in 1995 to Elie Wiesel for the company's actions during World War II (1939–1945) and the Holocaust. IG Farben, Bayer's parent company, used slave labour in factories it built in German concentration camps, most notably in the Monowitz concentration camp (known as Auschwitz III), part of the Auschwitz camp complex in German-occupied Poland. By 1943 almost half of IG Farben's 330,000-strong workforce consisted of slave labour or conscripts, including 30,000 Auschwitz prisoners. Helmuth Vetter, an Auschwitz camp physician, SS captain and employee of the Bayer group within IG Farben conducted medical experiments on inmates at Auschwitz and at the Mauthausen concentration camp. In one study of an anaesthetic, the company paid RM 170 per person for the use of 150 female inmates of Auschwitz. A Bayer employee wrote to Rudolf Höss, the Auschwitz commandant: "The transport of 150 women arrived in good condition. However, we were unable to obtain conclusive results because they died during the experiments. We would kindly request that you send us another group of women to the same number and at the same price." After the war, the Allied Control Council seized IG Farben for "knowingly and prominently ... building up and maintaining German war potential". [a] It was split into its six constituent companies in 1951, then split again into three: BASF, Bayer and Hoechst. Bayer was at that point known as Farbenfabriken Bayer AG; it changed its name to Bayer AG in 1972. Fritz ter Meer, an IG Farben director and Nazi Party member who directed operations at the IG Farben plant at Auschwitz, was sentenced in 1948 to seven years for war crimes during the IG Farben Trial at Nuremberg. Released in 1950, he was elected chair of Bayer's supervisory board in 1956 and remained in that position until 1964. In 1953 Bayer brought the first neuroleptic (chlorpromazine) onto the German market. In the 1960s Bayer introduced a pregnancy test, Primodos, that consisted of two pills that contained norethisterone (as acetate) and ethinylestradiol. It detected pregnancy by inducing menstruation in women who were not pregnant; the presence or absence of menstrual bleeding was then used to determine whether the user was pregnant. The test became the subject of controversy when it was blamed for birth defects, and it was withdrawn from the market in the mid-1970s. Litigation in the 1980s ended inconclusively. A review of the matter by the Medicines and Healthcare Products Regulatory Agency in 2014 assessed the studies performed to date and found the evidence for adverse effects to be inconclusive. Bayer has owned Alka-Seltzer since 1978. In 1978 Bayer purchased Miles Laboratories and its subsidiaries Miles Canada and Cutter Laboratories, acquiring along with them a variety of product lines including Alka-Seltzer, Flintstones vitamins and One-A-Day vitamins, and Cutter insect repellent. Along with the purchase of Cutter, Bayer acquired Cutter's Factor VIII business. Factor VIII, a clotting agent used to treat hemophilia, was produced, at the time, by processing donated blood. In the early days of the AIDS epidemic, people with hemophilia were found to have higher rates of AIDS, and by 1983 the CDC had identified contaminated blood products as a source of infection. According to the New York Times, this was "one of the worst drug-related medical disasters in history". Companies, including Bayer, developed new ways to treat donated blood with heat to decontaminate it, and these new products were introduced early in 1984. In 1997 Bayer and the other three makers of such blood products agreed to pay $660 million to settle cases on behalf of more than 6,000 hemophiliacs infected in United States. But in 2003 documents emerged showing that Cutter had continued to sell unheated blood products in markets outside the US until 1985, including in Malaysia, Singapore, Indonesia, Japan and Argentina, to offload a product they were unable to sell in Europe and the US; they also continued manufacturing the unheated product for several months. Bayer said it did this because some countries were doubtful about the efficacy of the new product. Bayer has been involved in other controversies regarding its drug products. In the late 1990s it introduced a statin drug, Baycol (cerivastatin), but after 52 deaths were attributed to it, Bayer discontinued it in 2001. The side effect was rhabdomyolysis, causing renal failure, which occurred with a tenfold greater frequency in patients treated with Baycol in comparison to those prescribed alternate medications of the statin class. Trasylol (aprotinin), used to control bleeding during major surgery, was withdrawn from the market worldwide in 2007 when reports of increased mortality emerged; it was later re-introduced in Europe but not in the US. Kogenate (recombinant clotting factor VIII). Kogenate is a recombinant version of clotting factor VIII, the absence of deficiency of which causes the abnormal bleeding associated with haemophilia type A. Kogenate is one of several commercially available Factor VIII products having equivalent efficacy. Xarelto (rivaroxaban) is a small molecule inhibitor of Factor Xa, a key enzyme involved in blood coagulation. In the United States, the FDA has approved rivaroxaban for the prevention of stroke in people with atrial fibrillation, for the treatment of deep vein thrombosis and pulmonary embolism, and for the prevention of deep vein thrombosis in people undergoing hip surgery. Rivaroxaban competes with other newer generation anticoagulants such as apixaban and dabigatran as well as with the generic anticoagulant warfarin. It has similar efficacy to warfarin and is associated with a lower risk of intracranial bleeding, but unlike warfarin there is no established protocol for rapidly reversing its effects in the event of uncontrolled bleeding or the need for emergency surgery. Betaseron is an injectable form of the protein interferon beta used to prevent relapses in the relapsing remitting form of multiple sclerosis. Betaseron competes with other injectable forms of interferon beta, glatiramer acetate, and a variety of newer multiple sclerosis drugs, some of which can be taken orally (Dimethyl fumarate, teriflunomide, others). Yasmin / Yaz birth control pills are part of a group of birth control pill products based on the progestin drospirenone. Yaz is approved in the United States for the prevention of pregnancy, to treat symptoms of premenstrual dysphoric disorder in women who choose an oral contraceptive for contraception, and to treat moderate acne in women at least 14 years of age who choose an oral contraceptive for contraception. The FDA conducted a safety review regarding the potential of Yaz and other drospirenone-containing products to increase the risk of blood clots; Yaz and Yasmin were associated with the deaths of 23 women in Canada, leading Health Canada to issue a warning in 2011. Although conflicting results were obtained in different studies, the FDA added a warning to the label in 2012 that Yaz and related products may be associated with an increased risk of clotting relative to other birth control pill products. Subsequently, a meta analysis suggested that birth control pills of the class Yasmin belongs to raise the risk of blood clots to a greater extent than some other classes of birth control pills. Nexavar (sorafenib) is a kinase inhibitor used in the treatment of liver cancer (hepatocellular carcinoma), kidney cancer (renal cell carcinoma), and certain types of thyroid cancer. Trasylol (Aprotinin) Trasylol is a trypsin inhibitor used to control bleeding during major surgery. In a 2006 meeting called by the FDA to review the drug's safety, Bayer scientists failed to reveal the results of an ongoing large study suggesting that Trasylol may increase the risks of death and stroke. According to a FDA official who preferred to remain anonymous, the FDA learned of the study only through information provided to the FDA by a whistleblowing scientist who was involved in it. The study concluded Trasylol carried greater risks of death, serious kidney damage, congestive heart failure and strokes. On 15 December of the same year the FDA restricted the use of Trasylol, and in November 2007 they requested that the company suspend marketing. In 2011, Health Canada lifted its suspension of Trasylol for its originally approved indication of limiting bleeding in coronary bypass surgery, citing flaws in the design of the studies that led to its suspension. This decision was controversial. In 2013 the European Medicines Agency lifted its suspension of the Trasylol marketing authorization for selected patients undergoing cardiac bypass surgery, citing a favorable risk-benefit ratio. Cipro (ciprofloxacin) Ciprofloxacin was approved by the US Food and Drug Administration (FDA) in 1987. Ciprofloxacin is the most widely used of the second-generation quinolone antibiotics that came into clinical use in the late 1980s and early 1990s. In 2010, over 20 million outpatient prescriptions were written for ciprofloxacin, making it the 35th-most commonly prescribed drug, and the 5th-most commonly prescribed antibacterial, in the US. Rennie antacid tablets, one of the biggest selling branded over-the-counter medications sold in Great Britain, with sales of £29.8 million. Bayer produces various fungicides, herbicides, insecticides, and some crop varieties. Fungicides are primarily marketed for cereal crops, fresh produce, fungal with bacteria-based pesticides, and control of mildew and rust diseases. Nativo products are a mixture of trifloxystrobin tebuconazole. XPro products are a mix of bixafen and prothioconazole, while Luna contains fluopyram and pyrimethanil. Herbicides are marketed primarily for field crops and orchards. Liberty brands containing glufosinate (a.k.a. Liberty or Basta) are used for general weed control. Capreno containing a mixture of thiencarbazone-methyl and tembotrione is used for grass and broad-leaf control. Insecticides are marketed according to specific crop and insect pest type. Foliar insecticides include Belt containing flubendiamide, which is marketed against Lepidopteran pests, and Movento containing spirotetramat, which is marketed against sucking insects. Neonicotinoids such as clothianidin and imidacloprid are used as systemic seed treatments products such as Poncho and Gaucho. In 2008 neonicotinoids came under increasing scrutiny over their environmental impacts starting in Germany. Neonicotinoid use has been linked in a range of studies to adverse ecological effects, including honey-bee colony collapse disorder (CCD) and loss of birds due to a reduction in insect populations. In 2013, the European Union and a few non EU countries restricted the use of certain neonicotinoids. Parathion was discovered by scientists at IG Farben in the 1940s as a cholinesterase inhibitor insecticide. Propoxur is a carbamate insecticide that was introduced by Bayer in 1959. In 1994 Bayer AG purchased Sterling Winthrop's over-the-counter (OTC) drug business from SmithKline Beecham and merged it with Miles Laboratories, thereby reclaiming the U.S. and Canadian trademark rights to "Bayer" and the Bayer cross, as well as the ownership of the Aspirin trademark in Canada. In 2004 Bayer HealthCare AG [de] acquired the over-the-counter Pharmaceutical Division of Roche Pharmaceuticals. In March 2008 Bayer HealthCare announced an agreement to acquire the portfolio and OTC division of privately owned Sagmel, Inc., a US-based company that markets OTC medications in most of the Commonwealth of Independent States countries such as Russia, Ukraine, Kazakhstan, Belarus, and others. On 28 August 2008 an explosion occurred at the Bayer CropScience facility at Institute, West Virginia, United States. A runaway reaction ruptured a tank and the resulting explosion killed two employees. The ruptured tank was close to a methyl isocyanate tank which was undamaged by the explosion. In March 2006 Merck KGaA announced a €14.6bn bid for Schering AG, founded in 1851. By 2006 Schering had annual gross revenue of around €5 billion and employed about 26,000 people in 140 subsidiaries worldwide. Bayer responded with a white knight bid and in July acquired the majority of shares of Schering for €14.6bn, and in 2007 Bayer took over Schering AG and formed Bayer Schering Pharma. The acquisition of Schering was the largest take-over in Bayer's history, and as of 2015 was one of the ten biggest pharma mergers of all time. In November 2010 Bayer AG signed an agreement to buy Auckland-based animal health company Bomac Group. Bayer partnered on the development of the radiotherapeutic Xofigo with Algeta, and in 2014 moved to acquire the company for about $2.9 billion. In 2014 Bayer agreed to buy Merck's consumer health business for $14.2 billion which would provide Bayer control with brands such as Claritin, Coppertone and Dr. Scholl's. Bayer would attain second place globally in nonprescription drugs. In June 2015 Bayer agreed to sell its diabetic care business to Panasonic Healthcare Holdings for a fee of $1.02 billion. In September 2015 Bayer spun out its $12.3 billion materials science division into a separate, publicly traded company called Covestro in which it retained about a 70% interest. Bayer spun out the division because it had relatively low profit margins compared to its life science divisions (10.2%, compared with 24.9% for the agriculture business and 27.5% for healthcare) and because the business required high levels of investment to maintain its growth, and to more clearly focus its efforts and identity in the life sciences. Covestro shares were first offered on the Frankfurt Stock Exchange in October 2015. Effective January 2016 following the spinout of Covestro, Bayer rebranded itself as a life sciences company, and restructured into three divisions and one business unit: Pharmaceuticals, Consumer Health, Crop Science, and Animal Health. In May 2016 Bayer offered to buy U.S. seeds company Monsanto for $62 billion. Shortly after Bayer's offer, Monsanto rejected the acquisition bid, seeking a higher price. In September 2016 Monsanto agreed to a $66 billion offer by Bayer. In order to receive regulatory approval, Bayer agreed to divest a significant amount of its current agricultural assets to BASF in a series of deals. On 21 March 2018 the deal was approved by the European Union, and it was approved in the United States on 20 May 2018. The sale closed on 7 June 2018. The Monsanto brand was discontinued; its products will be marketed under the Bayer name. In August 2018, two months after acquiring Monsanto, a U.S. jury ordered Monsanto to pay $289 million to a school groundskeeper who claimed his Non-Hodgkins lymphoma was caused by regularly using Roundup, a glyphosate-based herbicide produced by Monsanto. Following the verdict Bayer's share price dropped by around 14% or $14 Billion. The company filed an appeal on 18 September 2018. It faces 8,700 similar lawsuits alleging Roundup caused cancer. The general consensus among national regulatory agencies, and the European Commission is that labeled usage of the herbicide poses no carcinogenic or genotoxic risk to humans. In 2003, to separate operational and strategic managements, Bayer AG was reorganized into a holding company. The group's core businesses were transformed into limited companies, each controlled by Bayer AG. These companies were: Bayer CropScience AG; Bayer HealthCare AG; Bayer MaterialScience AG and Bayer Chemicals AG, and the three service limited companies Bayer Technology Services GmbH, Bayer Business Services GmbH and Bayer Industry Services GmbH & Co. OHG. In 2016, the company began a second restructuring with the aim of allowing it to transition to a life sciences based company. By divesting its Chemicals division in 2004 and with the aim of off-loading its Materials division by mid-2016, Bayer will be left with the four core units, as depicted below. Bayer CropScience has products in crop protection (i.e. pesticides), nonagricultural pest control, seeds and plant biotechnology. In addition to conventional agrochemical business, it is involved in genetic engineering of food. In 2002, Bayer AG acquired Aventis (now part of Sanofi) CropScience and fused it with their own agrochemicals division (Bayer Pflanzenschutz or "Crop Protection") to form Bayer CropScience; the Belgian biotech company Plant Genetic Systems became part of Bayer through the Aventis acquisition. Also in 2002, Bayer AG acquired the Dutch seed company Nunhems, which at the time was one of the world's top five seed companies. :270 In 2006, the U.S. Department of Agriculture announced that Bayer CropScience's LibertyLink genetically modified rice had contaminated the U.S. rice supply. Shortly after the public learned of the contamination, the E.U. banned imports of U.S. long-grain rice and the futures price plunged. In April 2010, a Lonoke County, Arkansas jury awarded a dozen farmers $48 million. The case is currently on appeal to the Arkansas Supreme Court. On 1 July 2011 Bayer CropScience agreed to a global settlement for up to $750 million. In September 2014, the firm announced plans to invest $1 billion in the United States between 2013 and 2016. A Bayer spokesperson said that the largest investments will be made to expand the production of its herbicide Liberty. Liberty is an alternative to Monsanto's product, Roundup, which are both used to kill weeds. In 2016, as part of the wholesale corporate restructuring, Bayer CropScience became one of the three major divisions of Bayer AG, reporting directly to the head of the division, Liam Condon. Bayer CropScience Limited is the Indian subsidiary of Bayer AG. It is listed on the Indian stock exchanges viz. the Bombay Stock Exchange & National Stock Exchange of India and has a market capitalization of $2 billion. Bayer BioScience, headquartered in Hyderabad, India has about 400 employees, and has research, production and an extensive sales network spread across India. Before the 2016 restructuring, Bayer HealthCare comprises a further four subdivisions: Bayer Schering Pharma, Bayer Consumer Care, Bayer Animal Health and Bayer Medical Care. As part of the corporate restructuring, Animal Health was moved into its own business unit, leaving the division with the following categories; Allergy, Analgesics, Cardiovascular Risk Prevention, Cough & Cold, Dermatology, Foot Care, Gastrointestinals, Nutritionals and Sun Care. Bayer Consumer Care manages Bayer's OTC medicines portfolio. Key products include analgesics such as Bayer Aspirin and Aleve, food supplements Redoxon and Berocca, and skincare products Bepanthen and Bepanthol. Women's healthcare is an example of a General Medicine business unit. Bayer Pharma produces the birth control pills Yaz and Yasmin. Both pills use a newer type of progestin hormone called drospirenone in combination with estrogen. Yaz is advertised as a treatment for premenstrual dysphoric disorder (PMDD) and moderate acne. Other key products include the cancer drug Nexavar, the multiple sclerosis drug betaferon/betaseron and the blood-clotting drug, Kogenate. In May 2014 it was announced that Bayer would buy Merck & Co's consumer health care unit for $14.2 billion. Bayer also controls Dihon Pharmaceutical Group Co., Ltd in China. The Pharmaceuticals Division focuses on prescription products, especially for women's healthcare and cardiology, and also on specialty therapeutics in the areas of oncology, hematology and ophthalmology. The division also comprises the Radiology Business Unit which markets contrast-enhanced diagnostic imaging equipment together with the necessary contrast agents. In addition to internal R&D, Bayer has participated in public–private partnerships. One example in the area of non-clinical safety assessment is the InnoMed PredTox program. Another is the Innovative Medicines Initiative of EFPIA and the European Commission. Bayer HealthCare's Animal Health Division is the maker of Advantage Multi (imidacloprid + moxidectin) Topical Solution for dogs and cats, Advantage flea control for cats and dogs and K9 Advantix, a flea, tick, and mosquito control product for dogs. Advantage Multi, K9 Advantix and Advantage are trademarks of Bayer. The division specializes in parasite control and prescription pharmaceuticals for dogs, cats, horses, and cattle. North American operation for the Animal Health Division are headquartered in Shawnee, Kansas. Bayer Animal Health is a division of Bayer HealthCare LLC. Bayer Business Services located at the Bayer USA Headquarters in Robinson Township, Pennsylvania, a suburb of Pittsburgh, Bayer Business Services handles the information technology infrastructure and technical support aspect of Bayer USA and Bayer Canada. This is also the headquarters of the North American Service Desk, the central IT Help Desk for all of Bayer USA and Bayer Canada. Bayer Business Services also employs 4500 specialists in India. Bayer Technology Services is engaged in process development and in process and plant engineering, construction and optimization. Currenta offers services for the chemical industry, including utility supply, waste management, infrastructure, safety, security, analytics and vocational training and is a joint venture between Bayer and Lanxess. Bayer Chemicals AG (with the exception of H.C. Starck and Wolff Walsrode) was combined with certain components of the polymers segment to form the new company Lanxess on 1 July 2004; Lanxess was listed on the Frankfurt Stock Exchange in early 2005. Bayer HealthCare's Diagnostics Division was acquired by Siemens Medical Solutions in January 2007. Bayer Diabetes Care managed Bayer's medical devices portfolio. Key products included the blood glucose monitors Contour Next EZ (XT), Contour, Contour USB and Breeze 2 used in the management of diabetes. The diabetes business unit was sold to Panasonic Healthcare Co. for $1.15 billion in June 2015. Bayer MaterialScience was a supplier of high-tech polymers, and developed solutions for a broad range of applications relevant to everyday life. On 18 September 2014, the Board of Directors of Bayer AG announced plans to float the Bayer MaterialScience business on the stock market as a separate entity. On 1 June 2015 Bayer announced that the new company would be named Covestro; Bayer formally spun out Covestro in September 2015. For the fiscal year 2017, Bayer reported earnings of EUR€7.3 billion, with an annual revenue of EUR€35 billion, a decrease of 25.1% over the previous fiscal cycle. Bayer's shares traded at over €69 per share, and its market capitalization was valued at US€65.4 billion in November 2018. In 1904, the company founded the sports club TuS 04 ("Turn- und Spielverein der Farbenfabriken vorm. Friedr. Bayer & Co."), later SV Bayer 04 ("Sportvereinigung Bayer 04 Leverkusen"), finally becoming TSV Bayer 04 Leverkusen ("Turn- und Sportverein") in 1984, generally, however, known simply as Bayer 04 Leverkusen. The club is best known for its football team, but has been involved in many other sports, including athletics, fencing, team handball, volleyball, boxing, and basketball. TSV Bayer 04 Leverkusen is one of the largest sports clubs in Germany. The company also supports similar clubs at other company sites, including Dormagen (particularly handball), Wuppertal (particularly volleyball), and Krefeld-Uerdingen (featuring another former Bundesliga football club, SC Bayer 05 Uerdingen, now KFC Uerdingen 05). In October 2008 Bayer's Canadian division was named one of "Canada's Top 100 Employers" by Mediacorp Canada Inc. The Canadian division was named one of Greater Toronto's Top Employers by the Toronto Star newspaper. Bayer USA was given a score of 85 (out of 100) in the Human Rights Campaign's 2011 Corporate Equality Index, a measure of gay and lesbian workplace equality. In 2016 Standard Ethics Aei gave a rating to Bayer in order to include the company in its Standard Ethics German Index. Bayer received an EE- rating, the fourth tier in an eight-tier ranking. ^ a b Peter Hayes (Cambridge University Press, 2001): "[O]ne of the first acts of the American occupation authorities in 1945 was to seize the enterprise as punishment for 'knowingly and prominently ... building up and maintaining German war potential'. Two years later, twenty-three of the firm's principal officers went on trial ... By the time John McCloy, the American high commissioner [for Germany], pardoned the last of them in 1951, IG Farben scarcely existed. Its holdings in the German Democratic Republic had been nationalized; those in the Federal Republic had been divided into six, later chiefly three, separate corporations: BASF, Bayer, and Hoechst." ^ a b "History of Bayer: 1863–1881". Bayer AG. ^ a b c "Bayer Group Consolidated Income Statements". Bayer AG. Retrieved 27 February 2019. ^ a b "Bayer Group Consolidated Statements of Financial Position". Bayer AG. Retrieved 27 February 2019. ^ "Personnel Expenses and Employee Numbers". Bayer AG. Retrieved 27 February 2019. ^ "Euro Stoxx 50, Börse Frankfurt (Frankfurt Stock Exchange)". Deutsche Boerse. Retrieved 17 January 2017. ^ Thomas, Natalie (24 February 2016). "Bayer confirms Werner Baumann as new chief". Financial Times. ^ a b Tammen 1978, p. 195. ^ "Law No. 9" (PDF). Allied Control Council. Archived (PDF) from the original on 22 September 2018. ^ Hayes 2001, pp. xxi–xxii; Dickerman 2017, p. 440. ^ a b c Hayes 2001, p. xxii. ^ a b Schneibel, Gerhard (19 August 2011). "Stock of former Nazi chemicals giant to be delisted". Deutsche Welle. ^ Neate, Rupert (4 June 2018). "Monsanto to ditch its infamous name after sale to Bayer". The Guardian. ^ a b Lewis & Zitzlsperger 2016, p. 92. ^ Sánchez-Serrano 2011, p. 51. ^ Schrör 2016, p. 12. ^ Schrör 2016, p. 8. ^ a b Mahdi, J.G. ; Mahdi, A.J. ; Mahdi, A.J. ; Bowen, I.D. (April 2006). "The historical analysis of aspirin discovery, its relation to the willow tree and antiproliferative and anticancer potential". Cell Proliferation. 39 (2): 147–155. doi:10.1111/j.1365-2184.2006.00377.x. PMID 16542349. ^ a b Tulett, Simon (28 May 2014). "'Genericide': Brands destroyed by their own success". BBC News. ^ Fuster, Valentin; Sweeny, Joseph M. (22 February 2011). "Aspirin: A Historical and Contemporary Therapeutic Overview". Circulation. 123 (7): 768–778. doi:10.1161/CIRCULATIONAHA.110.963843. PMID 21343593. ^ "WHO Model List of EssentialMedicines" (PDF). World Health Organization. October 2013. ^ "Felix Hoffmann ist der "Vater" des Aspirin" (Press release). Bayer AG, courtesy of LaHave Media Services Limited. September 1999. Archived from the original on 28 September 2007. ^ "Jewish Scientist's Claim to Discover Aspirin Denied by Nazis" (PDF) (Press release). Royal Society of Chemistry. 1999. Archived from the original (PDF) on 28 May 2005. ^ a b Sneader, Walter (23 December 2000). "The discovery of aspirin: a reappraisal". BMJ. 321 (7276): 1591–1594. doi:10.1136/bmj.321.7276.1591. PMC 1119266. PMID 11124191. ^ Moore, Deborah (24 August 2014). "Heroin: A brief history of unintended consequences". Times Union. ^ Fernandez & Libby 2011, p. 22. ^ "Felix Hoffmann". Science History Institute. 8 December 2017. ^ Edwards Jim (17 November 2011). "Yes, Bayer Promoted Heroin for Children — Here Are The Ads That Prove It". Business Insider. ^ López-Muñoz F, Ucha-Udabe R, Alamo C (December 2005). "The history of barbiturates a century after their clinical introduction". Neuropsychiatric Disease and Treatment. 1 (4): 329–343. PMC 2424120. PMID 18568113. ^ Sneader 2005, pp. 378–379. ^ Fourneau, E.; Th; Vallée, J. (1924). "Sur une nouvelle série de médicaments trypanocides". Comptes rendus de l'Académie des Sciences. 178: 675. ^ Vardanyan & Hruby 2016, p. 645. ^ "Gerhard Domagk". Nobel Foundation. ^ "Gerhard Domagk". Science History Institute. 4 December 2017. Archived from the original on 31 May 2018. ^ "Bayer's CEO Helge Wehmeier Faces Past and Fights for Future". CNN. 26 January 2002. ^ Dickerman 2017, p. 440. ^ "I.G. Auschwitz". Frankfurt: Wollheim Memorial, Fritz Bauer Institute. ^ Hayes 2001, pp. xxi–xxii. ^ Lifton & Hackett 1998, p. 310. ^ "Other doctor-perpetrators". Auschwitz-Birkenau Memorial and Museum. Archived from the original on 15 April 2016. ^ Strzelecka 2000, p. 363; Rees 2006, p. 179; Jacobs 2017, pp. 312–314. ^ Worthington, Daryl (20 May 2015). "IG Farben Opens Factory at Auschwitz". New Historian. Archived from the original on 22 May 2015. ^ Strzelecka 2000, p. 363; Rees 2006, p. 179; that the letter was directed at Höss, see Jeffreys 2009, p. 278. ^ "Law No. 9" (PDF). Allied Control Council. Archived (PDF) from the original on 22 September 2018. .
^ United Nations War Crimes Commission 1949, p. 63. ^ "Fritz (Friedrich Hermann) ter Meer (1884–1967)". Frankfurt: Wollheim Memorial, Fritz Bauer Institute. Retrieved 25 February 2012. ^ "Assessment of historical evidence on Primodos and congenital malformations – a synopsis" (PDF). Medicines and Healthcare Products Regulatory Agency. 2014. Retrieved 12 May 2014. ^ "Cutter Laboratories: 1897–1972. A Dual Trust". The Bancroft Library, University of California/Berkeley, Regional Oral History Office, transcript 1972–1974. ^ Bogdanich, Walt; Koli, Eric (19 September 2003). "2 Paths of Bayer Drug in 80's: Riskier One Steered Overseas". The New York Times. ^ Furberg, C.; Pitt, B. (2001). "Withdrawal of cerivastatin from the world market". Current Controlled Trials in Cardiovascular Medicine. 2 (5): 205–207. doi:10.1186/CVM-2-5-205. PMC 59524. PMID 11806796. ^ Mannucci PM, Mancuso ME, Santagostino E (2012). "How we choose factor VIII to treat hemophilia". Blood. 119 (18): 4108–14. doi:10.1182/blood-2012-01-394411. PMID 22411872. ^ Sardar P, Chatterjee S, Wu WC, Lichstein E, Ghosh J, Aikat S, Mukherjee D (2013). "New oral anticoagulants are not superior to warfarin in secondary prevention of stroke or transient ischemic attacks, but lower the risk of intracranial bleeding: insights from a meta-analysis and indirect treatment comparisons". PLoS ONE. 8 (10): e77694. doi:10.1371/journal.pone.0077694. PMC 3808395. PMID 24204920. ^ "Yaz and Yasmin pills linked to 23 deaths, say Health Canada documents". Macleans. The Canadian Press. 11 June 2013. "Health Canada reviewing safety of drospirenone-containing oral contraceptives (Yasmin and Yaz) and risk of venous thromboembolism". Health Canada. 7 June 2011. "Yasmin and Yaz (drospirenone): Updated information on increased risk of blood clots". Health Canada. 5 December 2011. ^ "FDA Drug Safety Communication: Updated information about the risk of blood clots in women taking birth control pills containing drospirenone". U.S. Food & Drug Administration. 10 April 2012. ^ Stegeman BH, de Bastos M, Rosendaal FR, et al. (2013). "Different combined oral contraceptives and the risk of venous thrombosis: systematic review and network meta-analysis". BMJ. 347: f5298. doi:10.1136/bmj.f5298. PMC 3771677. PMID 24030561. ^ Hasskarl J (2014). "Sorafenib: targeting multiple tyrosine kinases in cancer". Recent Results Cancer Res. Recent Results in Cancer Research. 201: 145–64. doi:10.1007/978-3-642-54490-3_8. ISBN 978-3-642-54489-7. PMID 24756790. ^ "FDA Statement Regarding New Trasylol Data". ^ "FDA Revises Labeling for Trasylol (Aprotinin Injection) to Strengthen Safety Warnings and Limit Usage of Drug to Specific Situations". ^ "FDA Requests Marketing Suspension of Trasylol". ^ "MedEffect - Health Canada's Response to the Final Report of the Expert Advisory Panel on Trasylol (aprotinin)". ^ Wood, Shelly (29 September 2014). "Aprotinin Reintroduction Puts Lives at Risk in Canada, EU". Medscape. Retrieved 18 April 2015. ^ McMullan V, Alston RP (2013). "III. Aprotinin and cardiac surgery: a sorry tale of evidence misused". Br J Anaesth. 110 (5): 675–8. doi:10.1093/bja/aet008. PMID 23599511. ^ Goossens H, Ferech M, Coenen S, Stephens P (April 2007). European Surveillance of Antimicrobial Consumption Project Group. "Comparison of outpatient systemic antibacterial use in 2004 in the United States and 27 European countries". Clin. Infect. Dis. 44 (8): 1091–5. doi:10.1086/512810. PMID 17366456. ^ "British Columbia Annual Summary of Antibiotics Utilization 2010" (PDF). Archived from the original (PDF) on 30 December 2013. ^ "A breakdown of the over-the-counter medicines market in Britain in 2016". Pharmaceutical Journal. 28 April 2017. Retrieved 29 May 2017. ^ "Bayer's Agricultural Products". Retrieved 15 April 2015. ^ "Fungicide list". Retrieved 15 April 2015. ^ Cressey, D. (2013). "Europe debates risk to bees". Nature. 496 (7446): 408. doi:10.1038/496408a. PMID 23619669. Gill, R. J.; Ramos-Rodriguez, O.; Raine, N. E. (2012). "Combined pesticide exposure severely affects individual- and colony-level traits in bees". Nature. 491 (7422): 105–108. doi:10.1038/nature11585. PMC 3495159. PMID 23086150. Dicks, L. (2013). "Bees, lies and evidence-based policy". Nature. 494 (7437): 283. doi:10.1038/494283a. PMID 23426287. Stoddart, C. (2012). "The buzz about pesticides". Nature. doi:10.1038/nature.2012.11626. Osborne, J. L. (2012). "Ecology: Bumblebees and pesticides". Nature. 491 (7422): 43–45. doi:10.1038/nature11637. PMID 23086148. Cressey, D. (2013). "Reports spark row over bee-bothering insecticides". Nature. doi:10.1038/nature.2013.12234. ^ Bees & Pesticides: Commission goes ahead with plan to better protect bees. 30 May 2013. ^ Charlotte McDonald-Gibson (29 April 2013). "'Victory for bees' as European Union bans neonicotinoid pesticides blamed for destroying bee population". The Independent. London. Retrieved 1 May 2013. ^ EXTOXNET Extension Toxicology Network. Pesticide Information Profile. Propoxur. June 1996. ^ OLMOS, DAVID (14 September 1994). "German Firm to Reclaim Bayer Aspirin Name : Drugs: It will acquire Sterling Winthrop's over-the-counter business and recover the rights it lost after WWI". LA Times. Retrieved 3 May 2013. ^ "Sale of Roche Consumer Health to Bayer completed" (Press release). Roche. 3 January 2005. Archived from the original on 17 September 2016. ^ "Bayer Buys Over-the-Counter Health Unit From Sagmel". Bloomberg. 11 March 2008. ^ "Bayer CropScience Pesticide Waste Tank Explosion". U.S. Chemical Safety Board. Retrieved 4 September 2014. ^ "Bayer Pesticide Plant Disaster, 2008, Institute, West Virginia". Semp.us. Archived from the original on 18 July 2011. Retrieved 14 June 2011. ^ "2005 a Record Year for Schering AG". Shering AG press release, PR Newswire. 20 February 2006. Archived from the original on 8 October 2016. ^ a b Kumar 2012, pp. 49–52. ^ Laforte, Marie-Eve (12 July 2006). Bayer completes acquisition of Schering AG. First Word Pharma. ^ Griffiths, Katherine (25 June 2006). "Bayer acquires Schering in €17bn deal". The Daily Telegraph. ^ Staff (13 April 2015). "Healthy appetite - the ten biggest pharmaceutical takeovers". Pharmaceutical Technology. ^ "Bayer Acquires Animal Health Co Bomac In New Zealand". Nasdaq. Retrieved 3 November 2010. ^ "Algeta Board OKs $2.9B Acquisition by Bayer". Gen. Eng. Biotechnol. News (paper). 34 (2). 15 January 2014. p. 10. ^ "Bayer and Merck - Investment Information". spiderbook.com. ^ Ludwig Burger (10 June 2015). "Bayer sells Diabetes Care business to Panasonic Healthcare". Reuters. Retrieved 10 June 2015. ^ a b c Alessi, Christopher (1 September 2015). "Bayer Separates Material Science Business Covestro". Wall Street Journal. ^ Gannon, Joyce (1 September 2015). "Bayer MaterialScience assumes its new identity as Covestro". Pittsburgh Post-Gazette. ^ Matthews, Sheenagh and Webb, Alex (6 October 2015). "Covestro Jumps on First Day of Trading in Frankfurt After IPO". Bloomberg News. ^ Ludwig Burger & Georgina Prodhan (23 March 2016). "Bayer defies critics with $62 billion Monsanto offer". Reuters. Retrieved 23 March 2016. ^ "Exclusive: Monsanto to reject Bayer bid seeking a higher price - sources". Reuters. 24 March 2016. Retrieved 24 March 2016. ^ "Bayer confirms $66bn Monsanto takeover". BBC News. 14 September 2016. Retrieved 5 June 2018. ^ "BASF: The unexpected winner in the Bayer-Monsanto merger". Handelsblatt Global Edition. 22 March 2018. Retrieved 5 June 2018. ^ "Bayer Will Sell More Units to BASF in Bid to Clinch Monsanto". Bloomberg News. 26 April 2018. Retrieved 5 June 2018. ^ Shevlin, Anthony; Drozdiak, Natalia (13 October 2017). "Bayer to Sell Assets to BASF for $7 Billion Amid Scrutiny of Monsanto Megadeal". Wall Street Journal. ISSN 0099-9660. Retrieved 5 June 2018. ^ "Competition Bureau asks Bayer to divest some Canadian assets to win Monsanto deal approval". The Globe and Mail. Retrieved 5 June 2018. ^ White, Aoife (21 March 2018). "Bayer Clears EU Hurdle for Monsanto Deal With BASF Sale". Bloomberg News. ^ "Bayer Wins U.S. Approval for Monsanto After Two-Year Quest". Bloomberg.com. 29 May 2018. Retrieved 5 June 2018. ^ "Bayer closes Monsanto acquisition" (Press release). Bayer AG. 7 June 2018. Retrieved 25 June 2018. ^ "Bayer to ditch Monsanto name after closing €54bn deal". The Irish Times. Retrieved 5 June 2018. ^ Rosenblatt, Joel; Burnson, Robert; Kresge, Naomi (13 August 2018). "Bayer Takes the Hit After Monsanto Loses Roundup Cancer Trial". Bloomberg. Retrieved 18 September 2018. ^ Burger, Ludwig (13 August 2018). "Roundup cancer verdict sends Bayer shares sliding". Reuters. ^ Bellon, Tina (18 September 2018). "Bayer's Monsanto asks U.S. court to toss $289 million glyphosate verdict". Reuters. ^ Allen, Nathan (5 September 2018). "Bayer's Monsanto: 8,700 lawsuits over glyphosate". Marketwatch. ^ Tarazona, Jose V.; Court-Marques, Daniele; Tiramani, Manuela; Reich, Hermine; Pfeil, Rudolf; Istace, Frederique; Crivellente, Federica (3 April 2017). "Glyphosate toxicity and carcinogenicity: a review of the scientific basis of the European Union assessment and its differences with IARC". Archives of Toxicology. 91 (8): 2723–2743. doi:10.1007/s00204-017-1962-5. PMC 5515989. PMID 28374158. ^ "The BfR has finalised its draft report for the re-evaluation of glyphosate - BfR". Retrieved 2018-08-18. ^ Guston, David; Ludlow, Karinne (2010). "Australian Pesticides and Veterinary Medicines Authority". Encyclopedia of Nanoscience and Society. 2455 Teller Road, Thousand Oaks California 91320 United States: SAGE Publications, Inc. ISBN 978-1-4129-6987-1. ^ US EPA, OCSPP (2017-12-18). "EPA Releases Draft Risk Assessments for Glyphosate" (Announcements and Schedules). US EPA. Retrieved 2018-08-18. ^ "Devgen to Acquire Rice, Sunflower, Sorghum and Pearl Millet Businesses in India and Other Asian Countries From Monsanto". monsanto.com. ^ "Newsham Genetics Acquiring Monsanto Choice Genetics". monsanto.com. ^ "Monsanto Company Acquires Agroeste Sementes, a Brazilian Corn Seed Company". monsanto.com. ^ "Eli Lilly and Company to Acquire Monsanto's POSILAC Brand Dairy Product and Related Business". monsanto.com. Archived from the original on 1 July 2017. Retrieved 27 April 2017. ^ "Monsanto Company to Invest in Technologies for Sugarcane With Acquisitions of CanaVialis and Alellyx". monsanto.com. ^ "Syngenta to Acquire Monsanto's Global Sunflower Assets". monsanto.com. ^ "Monsanto Acquires Agricultural Technology Leader Divergence, Inc". monsanto.com. ^ "Monsanto Acquires Targeted-Pest Control Technology Start-Up". monsanto.com. ^ "The Climate Corporation Acquires 640 Labs, Team to Bolster Industry-Leading Data Science Capabilities". monsanto.com. ^ "Monsanto Acquires Select Assets of Agradis, Inc. to Support Work in Agricultural Biologicals". monsanto.com. ^ "Monsanto Acquires Plant Trait Developer Rosetta Green". monsanto.com. ^ a b c d "Monsanto's American Seeds, Inc. Announces Five Acquisitions to Support Locally-Oriented Business Model". monsanto.com. ^ a b "Monsanto's American Seeds, Inc. Announces Two Strategic Acquisitions to Support Locally-Oriented Business Model". monsanto.com. ^ "Monsanto Adds NC+ Hybrids to American Seeds, Inc., Bolstering Regional Seed Company Approach to Serve Farmers". monsanto.com. ^ a b c d e "New Additions to American Seeds, Inc. Accelerate Growth in Monsanto's Regional Seed Company Approach". monsanto.com. ^ "Monsanto Forms American Seeds, Inc., an Investment Vehicle for Regional Seed Companies". monsanto.com. ^ a b "Monsanto Forms Holding Company to Invest in International Fruit and Vegetable Seed Companies". monsanto.com. ^ "Bayer organises its Life Science businesses into three divisions: Pharmaceuticals, Consumer Health and Crop Science". ^ "Names, Facts, Figures about Bayer". Bayer. 31 December 2015. Retrieved 7 March 2016. ^ "Bayer aligns organization with Life Science businesses - Bayer News". ^ a b c d e f g h i "Annual Report 2010". Bayer. Retrieved 1 March 2011. ^ Bloomberg (1 July 2011). "Bayer Settles With Farmers Over Modified Rice Seeds". The New York Times. ^ Patel, Nikhil (30 September 2015). "Bayer restructures its operations, drops Bayer Healthcare group". PMLive. ^ Our Bureau. "Bayer launches multi-crop breeding station in Hyderabad". The Hindu Business Line. ^ "Bayer restructures, appoints new board members - Borderless for leaders". ^ Kresge, Naomi (6 May 2014). "Bayer to Buy Merck Consumer-Health Unit for $14.2 Billion". Bloomberg. ^ "Bayer Focuses on Life Sciences". ^ "Profile of Pharmaceuticals at Bayer". ^ Mattes, William B. (2008). "Public Consortium Efforts in Toxicogenomics". In Mendrick, Donna L.; Mattes, William B. Essential Concepts in Toxicogenomics. Methods in Molecular Biology™. 460. pp. 221–238. doi:10.1007/978-1-60327-048-9_11. ISBN 978-1-58829-638-2. PMID 18449490. ^ "InnoMed PredTox Member Organizations". Archived from the original on 26 September 2008. Retrieved 25 August 2008. ^ Innovative Medicines Initiative. "IMI Call Topics 2008". IMI-GB-018v2-24042008-CallTopics.pdf. European Commission. Archived from the original on 15 October 2009. Retrieved 25 August 2008. ^ "Animal Health - homepage". ^ "Acquisition of Bayer's Diagnostic Division Finalized". Business Wire. ^ Kitamura, Makiko (10 June 2015). "Bayer to Sell Diabetes Unit to KKR Unit for $1.15 Billion". Bloomberg. ^ Bray, Chad (18 September 2014). "Bayer to Spin Off Plastics Group to Focus on Health Care". The New York Times. ^ Gannon, Joyce (1 June 2015). "Bayer to rename its MaterialScience business Covestro". Pittsburgh Post-Gazette. ^ "Bayer Bilanz, Gewinn und Umsatz | Bayer Geschäftsbericht | BAY001". wallstreet-online.de. Retrieved 2018-11-05. ^ "BAYN.DE Key Statistics | BAYER AG NA O.N. Stock - Yahoo Finance". finance.yahoo.com. Retrieved 2018-11-05. ^ "Bayer 04 Leverkusen Fussball GmbH". bayer04.de. Archived from the original on 26 January 2017. Retrieved 26 January 2017. ^ Workplace | Issues | Human Rights Campaign. Hrc.org (12 July 2013). Retrieved on 2013-07-17. ^ "Standard Ethics German Index". Bangen, Hans (1992). Geschichte der medikamentösen Therapie der Schizophrenie. Berlin: VWB-Verlag. ISBN 3-927408-82-4. Dickerman, Michael (2017). "Monowitz". In Bartrop, Paul R.; Dickerman, Michael. The Holocaust: An Encyclopedia and Document Collection. Volume 1. Santa Barbara: ABC-CLIO. pp. 439–440. Strzelecka, Irena (2000). "Experiments". In Długoborski, Wacław; Piper, Franciszek. Auschwitz, 1940–1945. Central Issues in the History of the Camp. Volume 2: The Prisoners, their Life and Work. Oświęcim: Auschwitz-Birkenau State Museum. Fernandez, Humberto; Libby, Therissa A. (2011). Heroin: Its History, Pharmacology & Treatment. Center City, MN: Hazelden Publishing. Hager, Thomas (2006). The Demon under the Microscope. Harmony Books. ISBN 1-4000-8214-5. Hayes, Peter (2001) . Industry and Ideology: IG Farben in the Nazi Era. Cambridge: Cambridge University Press. Jacobs, Steven Leonard (2017). "I G Farben". In Bartrop, Paul R.; Dickerman, Michael. The Holocaust: An Encyclopedia and Document Collection. Volume 1. Santa Barbara: ABC-CLIO. pp. 312–314. Jeffreys, Diarmuid (2009) . Hell's Cartel: IG Farben and the Making of Hitler's War Machine. London: Bloomsbury Publishing PLC. Kumar, B. Rajesh (2012). Mega Mergers and Acquisitions: Case Studies from Key Industries. New York: Palgrave Macmillan. ISBN 978-1137005908. Lewis, Derek; Zitzlsperger, Ulrike (2016). "Bayer AG". Historical Dictionary of Contemporary Germany. Lanham, MA, and Plymouth: Rowman & Littlefield. Lifton, Robert Jay; Hackett, Amy (1998). "Nazi Doctors". In Berenbaum, Michael; Gutman, Yisrael. Anatomy of the Auschwitz Death Camp. Bloomington: Indiana University Press. pp. 301–316. Rees, Laurence (2006) . Auschwitz: A New History. New York: PublicAffairs. Sánchez-Serrano, Ibis (2011). The World's Health Care Crisis: From the Laboratory Bench to the Patient's Bedside. Elsevier. ISBN 978-0123918758. Sneader, Walter (2005). Drug Discovery: A History. John Wiley & Sons. ISBN 978-0471899792. Schrör, Karsten (2016). Acetylsalicylic Acid. Weinheim: Wiley-VCH. Tammen, Helmuth (1978). Die I.G. Farbenindustrie Aktiengesellschaft (1925–1933): Ein Chemiekonzern in der Weimarer Republik. Berlin: H. Tammen. ISBN 3-88344-001-9. The United Nations War Crimes Commission (1949). "Law Reports of Trials of War Criminals. Volume X: The I.G. Farben and Krupp trials" (PDF). London: His Majesty's Stationery Office. pp. 1–67. Archived (PDF) from the original on 11 December 2008. Vardanyan, Ruben; Hruby, Victor (2016). Synthesis of Best-Seller Drugs. Academic Press. "The original Bayer Aspirin". wonderdrug.com. Bayer AG. Cornwell, John (2004). Hitler's Scientists: Science, War, and the Devil's Pact. London: Penguin Books. Lesch, John E., ed. (2000). The German Chemical Industry in the Twentieth Century. Dordrecht: Springer Netherlands. Plumpe, Gottfried (1990). Die I.G. Farbenindustrie AG: Wirtschaft, Technik und Politik 1904–1945. Berlin: Duncker & Humblot. Stokes, Raymond (1988). Divide and Prosper: The Heirs of I.G. Farben under Allied Authority, 1945–1951. Berkeley: University of California Press. Stokes, Raymond (1994). Opting for Oil: The Political Economy of Technological Change in the West German Chemical Industry, 1945–1961. New York: Cambridge University Press. Tully, John (2011). The Devil's Milk: A Social History of Rubber. New York: Monthly Review Press. Wikimedia Commons has media related to Bayer.